If you're a regular reader of FG, you'll have realised that one of my pet hates is anonymity and mystery in musical acts/bands. Sometimes people take it even further than that. 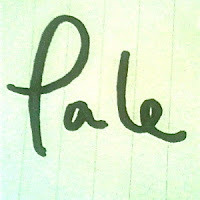 Take Pale, who emerged in April, then disappeared. To the extent they tried to erase their own history, and re-emerged with their "debut" track 'Too Much'. We're not sure about your sneaky moves, Alan Pownall. Listen to new track 'Doing My Time' below. You might remember Pownall in his efforts as a London troubadour in the mid-noughties. His early material as Pale appeared to be more in line with his previous solo stuff, although both 'Typical You' and 'Big Deal' have been deleted from the internet. Only one other blog wrote about the tracks at the time, and they've deleted that post so all I can tell you about those early Pale songs is that they were rather steeped in melodrama. The duo (at least, that's what Pale appear to be) re-birthed in October, with the much more electro-heavy 'Too Much', making a significant impression in the blogosphere as well as suggesting that it was their debut offering. Now you know it wasn't. Does that matter? Yes and no. I like music to have integrity and honesty, and artists to not be disingenuous. At the same time, good music is good music. 'Too Much' wasn't quite exciting enough for me but new track 'Doing My Time' is much more to my liking. In fact, it evokes memories of the early Pale recordings - steeped in melancholia, and with a much more subtle electro vibe. In another nod to mid-noughties London music, the video has been directed by Joe Ridout, who I believe used to be in the now defunct Video Nasties. One of the main reasons I wrote about Pale back in April was to see how they'd play out their anonymity angle. Their veil of mystery marketing is now disappearing/metamorphosing, with live dates under their belt, and a video that reveals their faces. So far, so interesting. Appropriately, the band support the mystery-loving NOCEREMONY// this evening in London.